The Glasgow School of Art (GSA) is Scotland's only public, self-governing art school offering undergraduate degrees; post-graduate awards (both taught and research-led) and PhDs in architecture, fine art and design. The school is housed in a number of buildings in the centre of Glasgow, the most famous of which was designed by Charles Rennie Mackintosh in phases between 1896-1909. The eponymous Mackintosh Building soon became one of the city's iconic landmarks and stood for over 100 years. The building was severely damaged by fire in May 2014 and destroyed by a second fire in June 2018, with only the burnt-out shell remaining. Founded in 1845 as the Glasgow Government School of Design, the school changed its name to The Glasgow School of Art in 1853. Originally located at 12 Ingram Street the school moved to the McLellan Galleries in 1869. In 1897, work began on a new building to house the school on Renfrew Street, funded by a donation of £10,000 from the Bellahouston Trust, left from the will of Moses Stevens of Bellahouston. The building was designed by Charles Rennie Mackintosh, chosen for the commission by the school's director, Francis Newbery, who oversaw a period of expansion and fast-growing reputation. The first half of the building was completed in 1899 and the second half in 1909. The School's campus has grown since that time and in 2009 an international architectural competition was held to find an architect-led design team who would develop the Campus Masterplan and design the Phase 1 building. The competition was won by New York-based Steven Holl Architects working with Glasgow-based JM Architects. The Reid Building was completed in 2014 and sits opposite the now destroyed Mackintosh Building on a site previously occupied by the Foulis, Assembly and Newbery Tower Buildings. The school has produced most of Scotland's leading contemporary artists including, since 2005, 30 per cent of Turner Prize nominees and five recent Turner Prize winners: Simon Starling in 2005, Richard Wright in 2009, Martin Boyce in 2011, Duncan Campbell in 2014 and Charlotte Prodger in 2018. The School of Architecture is highly rated by the architecture profession and the School of Design has been described by Design Week as "leaders in design education". GSA also has a long-established portfolio of non-degree art and design classes for children and adults delivered through GSA Open Studio. Disciplines within the five schools include fine-art photography (founded by Thomas Joshua Cooper in 1982); painting and printmaking, sculpture and environmental art, product design, product-design engineering, textile design, fashion design, silversmithing and jewellery design, interior design, communication design, interaction design, and architecture. The original Mackintosh building was severely damaged by fire on 23 May 2014. An initial fire service estimate was that 90 per cent of the building and 70 per cent of its contents had been saved. The fire, which began in the basement, quickly spread upwards and, although it was brought under control quite quickly, significant damage was done to the historic studios and stairways. The renowned Mackintosh library was destroyed; the archive was water damaged, but was able to be air and freeze dried. There were no reported casualties. The fire broke out as students were preparing for their Degree Show. Eyewitnesses said that the fire appeared to have started when a projector exploded in the basement of the Charles Rennie Mackintosh building just before 12:30 pm. Investigators later determined that the cause was not a faulty projector, but "a canister of expanding foam" used in close proximity to a hot projector, causing flammable gases to ignite. According to The Scotsman newspaper, the use of aerosol cans is against school policy. The report from the Scottish Fire and Rescue Service found that the design of the building contributed greatly to the spread of the fire: "the number of timber lined walls and voids, and original ventilation ducts running both vertically and horizontally throughout the building" as well as "a vertical service void", which "ran the entire height of the building … [and] allowed flames, hot gases, and smoke to travel". Fire and smoke dampers, which are intended to prevent the spread of fire and smoke through ducts, had not been retrofitted. In addition, an intended "fire suppression system" for the building had not been completed. A school staff member was on hand when the blaze first ignited, but was unable to contain the fast-spreading flames. A careful restoration process began soon after the fire; work on restoring and recreating the Mackintosh design, including the famous library interior, started in 2016. The restoration was performed with historical accuracy, including the use of original wood species such as longleaf pine and tulipwood. A large fire broke out in the Mackintosh Building on 15 June 2018, causing extensive damage. Emergency services received the first call at 11:19 pm BST, and 120 firefighters and 20 fire engines were dispatched to the fire. No casualties were reported. The cause of the fire is not yet known. [update] Alan Dunlop, visiting professor of architecture at Robert Gordon University who studied at the Mackintosh School of Architecture, was contacted by the press immediately after the fire and stated: "I can’t see any restoration possible for the building itself. It looks totally destroyed." This point of view was not supported by the early external building surveys, which appeared to indicate that much of the exterior had survived, though extensively damaged. Drone footage enabled a clearer assessment of the extent of the interior damage, and a programme of partial dismantling was established to stabilise the portions of the facade at risk of collapse, notably the south elevation. A Glasgow City Council spokesperson said: "There is a consensus emerging that the intention of the building control people, HES (Historic Environment Scotland) people and the art school is to save the building... Right now, people are operating on the understanding it will be saveable." It was also noted by Roger Billcliffe that “It has been voted Britain’s most important building several times over, and we have all of the information needed to recreate every detail, following extensive laser surveys after the first fire." The first opportunity for the school administration to visit the site happened on 19 June 2018. Muriel Gray, Chair of the Board of Governors, stated: "This was the first opportunity for the expert team to see the building and begin what will be a long and complex process of determining the future of the Mack, but we remain optimistic. There is a huge desire to see Mackintosh’s masterpiece rise again, one which we all share. We have incredibly detailed information on the building collated over the last 4 years, and have worked with teams of talented craftspeople who were doing a tremendous job on the restoration." In a subsequent statement to the BBC, Professor Tom Inns, director of the school, affirmed that "This building is not beyond saving. It will be saved in some form." He continued to support his firm belief that the building should continue in its function as a working art school, rather than a museum. At the time of the fire, sprinklers had yet to be installed in the building. Components for the fire suppression system had been delivered the day before, but were weeks away from assembly and testing. Building control officers have expressed concerns that the end walls may collapse. The building remains cordoned off and affected residents have been offered accommodation by Glasgow City Council. On 28 June 2018 it was announced that work is being planned to take down parts of the building that are in danger of collapse. Compensation for local residents and businesses will be made available by the Scottish Government. On 29 June 2018, Glasgow School of Art terminated its £25 million restoration contract with Kier following the Mackintosh Building fire. The school has a large footprint across Glasgow: Since the fire of May 2014 the School of Fine Art has been temporarily housed in a campus at the Tontine Building, Merchant City, Glasgow  ; The School of Design, The Innovation School and The Mackintosh School of Architecture, along with the GSA Library are all located in and around the Garnethill area, where the Mackintosh Building sits. The School of Simulation and Visualisation (formerly the Digital Design Studio (DDS)) is based on the southside of Glasgow in The Hub, at Pacific Quay by the River Clyde. The Mackintosh Building was the heart of the campus and continued to be a functioning part of the school until the first major fire on 23 May 2014. The building housed the Fine Art Painting department, first year studios and administrative staff. It houses the Mackintosh gallery which held many different exhibitions throughout the year. The Mackintosh Gallery (also known as the Mackintosh Museum) was the only part of the Mackintosh building open to the general public; all other areas of the school were only viewable by guided tour. An exception to this rule was the Degree Show where all the studios within the Mackintosh building were opened to allow people to view the graduating year's final artworks. while the Mackintosh Building underwent restoration and the newly acquired Stow Building is refurbished. An international architectural competition was launched in March 2009 to find the design team to prepare a campus masterplan and detailed design of the first new building phase. The winner of the competition was Steven Holl Architects, working in partnership with Glasgow’s JM Architects and Arup Engineering. Work commenced in 2011 and continued until 2013. The building was structurally complete in 2013. The new building was named the Reid Building after the Director who was in post at the time of the commissioning: Dame Seona Reid, and won Building of the Year at the 2014 Architect's Journal awards – the AJ100 Awards in May 2014, and the Award for Arts or Entertainment Structures at the IStructE's 2014 Structural Awards. The Innovation School also has a base in Forres, Morayshire focusing on research-led teaching at post-graduate level. Since September 2012, the GSA has delivered years 3 and 4 of its Bachelor of Arts (Hons) Programmes in Communication Design and Interior Design in Singapore, in partnership with the Singapore Institute of Technology (SIT), based at the Temasek Polytechnic Campus in Tampines. The programmes enable Diploma students from the Singapore Polytechnics to progress from a Diploma to a BA (Hons) degree. Students studying in Singapore benefit from the same programme of study and award as in the home institution, along with resources and equipment according to the GSA specifications. The GSA has been ranked in the top 10 of specialist educational institutions in The Guardian University Guide, ranking it the top specialist visual arts institution in the UK. Its degrees are validated by the University of Glasgow. Of its 1,900 students, almost 20 per cent are international, 20 per cent from the rest of the UK and approximately 20 per cent are postgraduate. The GSA is placed 8th in the 2019 QS World Rankings for Art and Design and 2nd in the nationally ranking 2016 Complete University Guide league table for Art and Design. HESA statistics show the GSA to have one of the lowest student drop-out rates in the UK. In 2002 the funding councils published figures which placed Glasgow School of Art as having the second-lowest number of students from a working-class background out of a list of UK higher education institutions. With 7 per cent of its students coming from social classes IIIm, IV and V (skilled manual, semi-skilled or un-skilled workers), the figures put it above Oxford and Cambridge in terms of exclusivity. 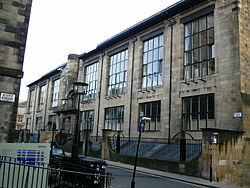 Glasgow School of art disputed the figures, explaining that the majority of its applicants did not come through the UCAS system on which the statistics were based so the numbers involved were very small. This was reinforced by HEFCE, which said the figures should be treated with care. In March 2016, the Commission on Widening Access (CoWA) found the percentage of Scottish-domiciled full-time first degree entrants from SIMD 20 (20 per cent most deprived areas of Scotland) at the GSA was 22.2 per cent. This is the second highest in Scotland, according to CoWA's report, with only University of the West of Scotland having more. Research professors include Professor Thomas Joshua Cooper, Professor Alastair Macdonald, Professor Tim Sharpe, Professor Irene McAra-McWilliam OBE, Professor Ken Neil, Professor Johnny Rodger, Professor Christopher Platt, Professor Steve Love, Professor Paul Chapman and Professor Brian Evans. The school runs an annual public programme of exhibitions and events. The Reid Gallery has a curated programme that works with contemporary artists, designers and architects; and GSA staff and students, and makes connections to the heritage and architecture of the Glasgow School of Art and its collections. Charlotte Prodger Artist, Turner Prize recipient 2018. ^ a b Carrell, Severin; Brooks, Libby; Rawlinson, Kevin (16 June 2018). "'Heartbreaking': fire guts Glasgow School of Art for the second time". The Guardian. Retrieved 16 June 2018. ^ "Steven Holl Architects". Stevenholl.com. 7 February 2014. Retrieved 15 February 2014. ^ "jmarchitects; Seona Reid Building, Glasgow School of Art". jmarchitects.net. Retrieved 16 April 2019. ^ "World's Best Architecture Schools and Universities – Top 10 List". Graduatearchitecture.com. Archived from the original on 16 February 2013. Retrieved 15 February 2014. ^ "Glasgow School of Art". Fulbright Partners. The US-UK Fulbright Commission. Retrieved 24 May 2014. ^ a b "Glasgow School of Art: Fire crews battle to save building". BBC. Retrieved 23 May 2014. ^ "Glasgow School of Art fire brought under control". The Guardian. 23 May 2014. Retrieved 24 May 2014. ^ "Glasgow School of Art: Fire crews save most of building". BBC News. Retrieved 24 May 2014. ^ "Glasgow School of Art fire: Iconic library destroyed". BBC News. Retrieved 24 May 2014. ^ "Firefighters battle major blaze at Mackintosh Glasgow School of Ar". STV News. Retrieved 23 May 2014. ^ CRAIG BROWN. "Glasgow School of Art fire a 'freak accident'". The Scotsman: Scotland on Sunday. Retrieved 26 November 2014. ^ Shea, Christopher (11 July 2016). "Restoring a Charles Rennie Mackintosh Architectural Gem From the Ashes". New York Times. Retrieved 12 July 2016. ^ Brooks, Libby (24 November 2016). "Glasgow School of Art's library restoration begins in earnest". The Guardian. Retrieved 28 February 2017. ^ "The Mackintosh at the Glasgow School of Art". Retrieved 9 August 2017. ^ "Glasgow Jewel Goes Up in Flames for Second Time in 4 Years". Ny Times. Retrieved 16 April 2019. ^ "Glasgow fire: Major blaze ravages art school's Mackintosh Building". BBC News. BBC. Retrieved 15 June 2018. ^ "Scott Sutherland Aberdeen: School of Architecture - e-architect". e-architect. 2010-01-30. Retrieved 2018-06-19. ^ "Glasgow School of Art may be beyond repair after second fire". The Guardian. Retrieved 17 June 2018. ^ "Work begins to dismantle dangerous sections of the Mackintosh Building". ^ "Glasgow School of Art building expected to be saved from demolition". 18 June 2018. ^ Wainwright, Oliver (19 June 2018). "Bulldoze or rebuild? Architects at odds over future of Glasgow School of Art". ^ "Statement from the GSA 19 June 2018 - Work to assess the condition of the Mackintosh Building underway". gsa.ac.uk. Retrieved 16 April 2019. ^ "Fire-ravaged art school 'will be saved'". BBC News. 2018-06-19. Retrieved 2018-06-19. ^ "Glasgow School of Art fire safety system 'was weeks away'". BBC News. 24 June 2018. Retrieved 24 June 2018. ^ "Glasgow School of Art in danger of 'sudden collapse'". BBC News. 28 June 2018. Retrieved 28 June 2018. ^ "GSA Degree Show takes root in Trongate". 2015. ^ "Graphic Design Agency / Brand Consultants Midlands – Alt Design". Alt Design. Archived from the original on 2009-09-10. ^ CathieRandall. "Tours". Gsa.ac.uk. Retrieved 15 February 2014. ^ "Mackintosh Campus Appeal". The Glasgow School of Art. May 2016. ^ Waite, Richard (17 September 2010). "Steven Holl unveils Glasgow School of Art Mackintosh designs". Architects Journal. Retrieved 15 February 2014. ^ "Glasgow School of Art Competition – Extension Building". Glasgow Architecture. ^ "University guide 2012: Specialist institutions league table". The Guardian. London. 17 May 2011. ^ "QS World University Rankings by Subject 2019 – Art & Design". 26 Feb 2019. ^ "Top UK University League Tables and Rankings 2017". ^ "University drop-out rate". BBC News. 4 June 2008. ^ "Which universities have the highest first year dropout rates?". Channel 4 News. 28 August 2017. ^ MacLeod, Donald (18 December 2002). "Glasgow 'posher' than Oxbridge". The Guardian. London. ^ "REF2014 results by institution/Glasgow School of Art". results.ref.ac.uk. 2014. ^ "Institute of Design Innovation on Vimeo". Vimeo.com. 11 December 2012. Retrieved 15 February 2014. ^ ScottParsons. "Research Centres". Gsa.ac.uk. Retrieved 15 February 2014. ^ "GSA Events". Gsa.ac.uk. Retrieved 15 February 2014. ^ a b c d Peter J.M. McEwan (1994). The Dictionary of Scottish Art and Architecture. Antique Collectors' Club. ISBN 1 85149 134 1. ^ a b c d e David Buckman (2006). Artists in Britain Since 1945 Vol 1, A to L. Art Dictionaries Ltd. ISBN 0 953260 95 X. ^ "HARRY BENSON". socialstereotype.com. Archived from the original on 25 May 2014. ^ "Artist profile". commarts.com. Communication Arts. 8 August 2009. Archived from the original on 2 January 2011. Retrieved 6 September 2010. ^ Gary Nisbet. "Douglas Bisset (1908–2000)". Glasgow – City of Sculpture. Retrieved 3 March 2017. ^ Royal Scottish Academy. "Images for Scottish Art, Robert Henderson Blyth". Royal Scottish Academy. Archived from the original on 2 July 2013. Retrieved 16 June 2014. ^ Buckman, David (15 November 1999). "Leonard Boden Obituary". The Independent. London. Retrieved 9 October 2013. ^ a b c d e f g h i j k l m n o p q r s t u v w x y z aa ab ac ad ae af ag ah ai aj ak al am an ao ap aq "Famous Alumni". Glasgow School of Art. Retrieved 24 May 2014. ^ "Emilio Coia HonLLD (Strath)" (PDF). ^ "Turner Prize 2007:The artists – Tate". 13 September 2014. Archived from the original on 13 September 2014. ^ "Robert Colquhoun – Tate". Tate. ^ McTear's Auctioneers. "McTear's The Scottish Picture Auction". McTear's Auctioneers. Archived from the original on 12 May 2014. Retrieved 8 May 2014. ^ "Ken Currie". Art UK. ^ Halsby, Julian (1990). "Alexander Brownlie Docharty, 1862-1940". Venice, the Artist's Vision: A Guide to British and American Painters. Unicorn. ISBN 9780906290354. Retrieved 15 August 2014. ^ WJC Henderson (2010). "Chris J Fergusson (Chris Stark) The life and works of a Dumfries and Galloway artist". Retrieved 27 January 2015. ^ * "John Glashan", British Cartoon Archive. Accessed 20 August 2016. ^ "Doris Grant". The Daily Telegraph. London. 29 March 2003. ^ National Galleries of Scotland. "Scottish Artists A-Z − − H − Scottish Artists A-Z − Scottish Art − Collection − National Galleries of Scotland". nationalgalleries.org. ^ "Artist Ilana Halperin reflects on the scientific and the personal". www.scotsman.com. Retrieved 7 April 2018. ^ Foley, Jack. "A bold and beautiful new exhibition". IndieLondon. Retrieved 20 December 2010. ^ Wright, Karen (21 August 2014). "Tessa Lynch, sculptor: 'You meet interesting people in Glasgow who". The Independent. ^ "Two Women of Distinction". The Glasgow Herald. 2 April 1948. Retrieved 9 February 2012. ^ "Charles Rennie Mackintosh". Archived from the original on 4 January 2016. ^ "Overview of Rory Macdonald". scottish-places.info. ^ "Gillies MacKinnon". British Film Institute. Retrieved 8 January 2014. ^ a b c David Buckman (2006). Artists in Britain Since 1945 Vol 2, M to Z. Art Dictionaries Ltd. ISBN 0 953260 95 X. ^ "Philip Raskin – Artists – Strathearn Gallery". ^ Wells, Tish (29 October 2008). "To Iain McCaig, 'Star Wars' characters are more than just imagination", McClatchy-Tribune News Service. Retrieved 16 November 2010. ^ "'Bee Keepers I', Elizabeth McDonald". www.liverpoolmuseums.org.uk. Retrieved 20 September 2018. ^ "Who's Who in Glasgow in 1909: T. CORSAN MORTON [ebook chapter] / George Eyre-Todd, 1909". strath.ac.uk. ^ Celia Purcell Contemporary. "Celia Purcell Contemporary". celiapurcell.com. ^ Grigor, Murray (26 January 2010). "Obituary". The Guardian. London. Retrieved 6 January 2013. ^ "Ciara Phillips". Re-title.com. Archived from the original on 26 October 2004. Retrieved 8 May 2014. ^ "Interview: Fashion designer Jonathan Saunders". ^ "CURRICULM VITAE DAVID SHRIGLEY". David Shrigley. Archived from the original on 29 January 2012. ^ "LUCY SKAER – YU". yaleunion.org. ^ "Music & Apple Pie with Sharleen Spiteri – On The Hill". 5 January 2016. ^ "Thomas Smith Tait". Dictionary of Scottish Architects. Retrieved 16 November 2008. ^ Farago, Jason (8 May 2014). "Movers and makers: the most powerful people in the art world". The Guardian. Retrieved 30 May 2014. ^ "Richard Wright Biography – Richard Wright on artnet". artnet.com. ^ "Kumiyamashita.com". Archived from the original on 7 July 2016. Retrieved 6 September 2015.